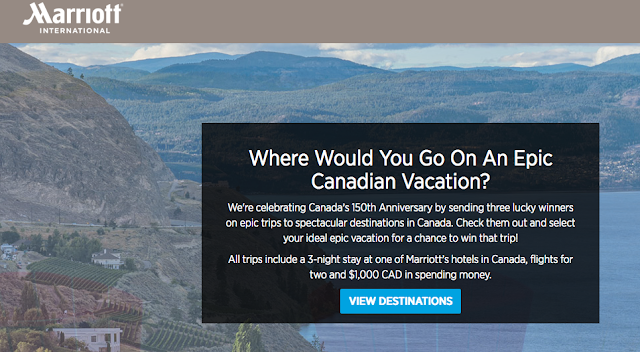 The Canada 150 offers and contests keep coming! We post those relevant to our readership and know there are way more than what pass along however the offers we do know those we pass along resonate well with our readership! 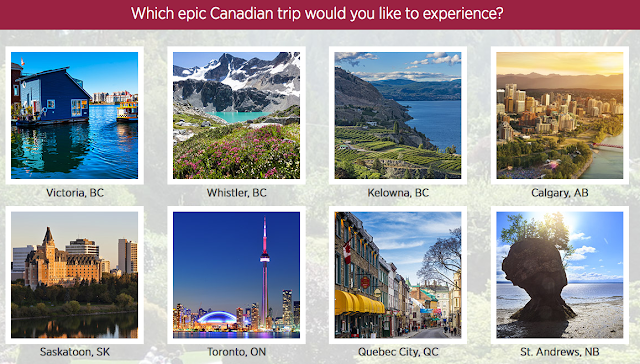 The latest is this contest from Marriott International (which also includes SPG) where you can win an Epic Trip within Canada thanks to Marriott. There are actually two contests you can enter, one for the Marriott family of hotels and one for the Starwood family of hotels. You can enter once daily and no purchase is required! You'll also earn additional entries for referring people to the contests. Both contest prizes are very similar. They include three nights at a hotel, flights for two and C$1,000 in spending money! You can enter the Marriott Contest here. 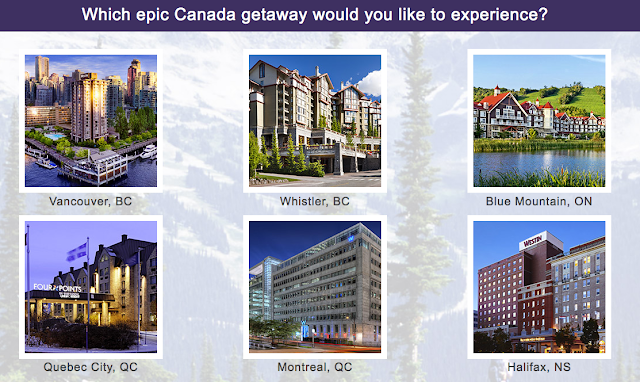 The Marriott’s EPIC Canada Adventure Sweepstakes (the "Sweepstakes") is open to legal residents of the fifty (50) United States (including the District of Columbia), and Canada (including Quebec) who, as of date of entry, are at least eighteen (18) years of age or the age of majority in their respective states/jurisdictions of permanent residence, whichever is greater. You can enter the SPG Contest here. SPG’s EPIC Canada Adventure Sweepstakes (the "Sweepstakes") is open to legal residents of the fifty (50) United States (including the District of Columbia), and Canada (including Quebec) who, as of date of entry, are at least eighteen (18) years of age or the age of majority in their respective states/jurisdictions of permanent residence, whichever is greater.